Light up your designs with Bling!  Single-clicking a thread in the Threads docker or Colorway Editor docker simply selects the color.  Double-clicking a thread in either docker assigns it to the currently selected color in the Color toolbar and updates the Colorway Editor docker accordingly.  Typing a code and pressing in either docker has the same effect.  The Assign Thread button has returned to Threads pane and Threads docker toolbar.  The Add Color (+) button on the Color toolbar once again the sole mechanism for adding a color slot to the palette. Some French text appears in the German installation of EmbroideryStudio e4.2. This issue has been solved with the release of Update 1.  Go to Start > Region.  Tick ‘Welcome screen and system accounts’.  Click OK. This will apply your regional settings to the System Account so any new designs should show in correct units.  Go to Start > Indexing Options.  Under ‘Troubleshooting’, click Rebuild. All your measurement units should now be consistent. Certain design data – title, width, height, colors, stitches – is not shown correctly in Design Library on some PCs. This problem may occur on machines that do not meet minimum requirements. Re-indexing usually helps though, so could also be suggested as another workaround. The problem may also occur when software is run on virtual machines with sub-spec settings. See System Requirements below. USB port Required for software installation and security device. Sound card Required for online video help. Internet connection may also be required during installation in order to download Windows features. Since EmbroideryStudio no longer supports Windows® 32-bit operating systems, we recommend updating to Windows® 10 (64-bit edition) with latest updates installed. You will, however, need to uninstall any earlier versions of CorelDRAW® Graphics Suite. For latest operating system information, visit the Wilcom Support Center at www.wilcom.com.au/support. EmbroideryStudio occupies up to 5GB of hard disk space, depending on options installed. CorelDRAW® Graphics Suite also takes up an additional 3GB. However, you need additional free space for your applications to run smoothly. Some controls may be hidden on the user interface if you run your monitor at low resolutions. The physical size of your monitor will have a bearing on the optimum screen resolution. Larger fonts will exacerbate the problem. If you experience visibility issues, try adjusting both screen resolution and font size. For example, a resolution of 1600 x 900 with a font size of 100% or 125% should be acceptable. Faster and more accurate than before, EmbroideryStudio e4 TrueSizer Pro is the tool you need for improving your customer service. If you don’t require all the power and capabilities of the more advanced EmbroideryStudio e4 suite but looking to do more with your designs, look no further. 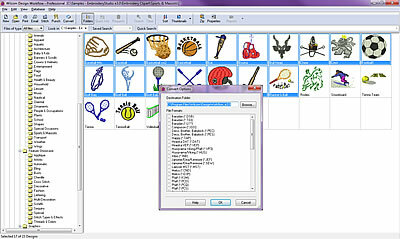 The Embroidery Web API is Wilcom's embroidery automation software tool kit. It enables embroidery and apparel companies to add embroidery capabilities to their custom web sites, web applications, and internal business systems by calling the API to do embroidery specific tasks. Compatible with all version .EMB designs from Wilcom digitizing software up to e4/4.1, The Wilcom API enables you to go from order to production stitch data automatically. It creates TrueView simulation images and production-ready stitch data for existing embroidery designs, plus personalized lettering, re-coloring existing designs, or create new lettering, monograms, and team names. Output to .EMB, .DST and other popular machine stitch data formats. Wilcom DesignWorkflow™ breaks through the walls of communication between departments by creating windows into the design creation process. By connecting each stage of the design process, DesignWorkflow™ electronically tracks the design and empowers staff with information needed to perform efficiently. 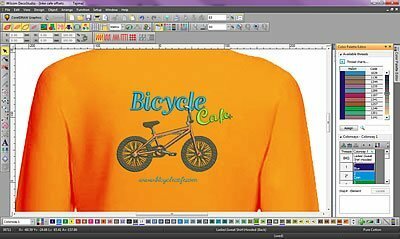 Graphics to stitch conversion – enhanced! Auto Fabrics for best stitch results - enhanced! USB Ports Dedicated USB port for a USB Dongle. Data drives DVD-ROM Drive for software installation Backup Device - e.g. DVD Burner, Tape Backup, removable hard drive. *Although Windows XP (32bit) is supported, Wilcom highly recommend you consider updating to latest Windows operating system.